The 49 error is a communication error on HP LaserJet printers, which can be quite frustrating and oftentimes generates an expensive and totally unnecessary service call to remedy. The steps to clear this error and determine the cause are as follows. 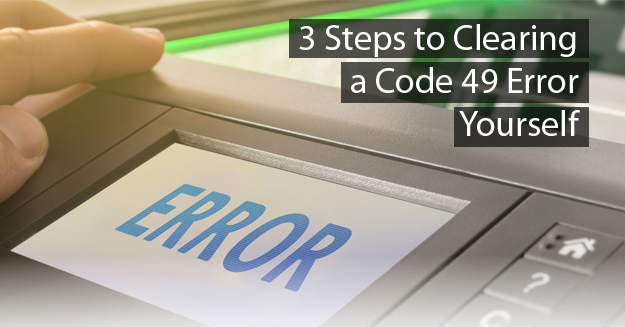 First, the 49 error could be a communication error, which can occur when the printer is unable to process a print job sent to the machine. Disconnect the network or computer cable from the back of the printer. Power the printer off for 30 seconds, then power it back on. If the printer comes to ‘ready’, proceed to step 3. If the error returns, then move on to the third step (hardware) below. At this point, we have determined that the machine is most likely not the problem. We now need to clear any pending print jobs in the print queue. If you skip this step, the offending job will simply resend when you reconnect the network cable and the error will re-occur. We have found that, most of the time, the job causing the error is a file being printed from a website. 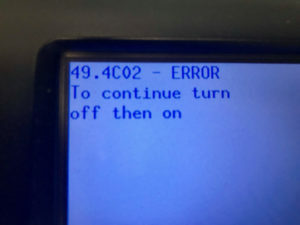 Once you have cleared all jobs, you can now reconnect the network cable and continue with your printing, error free! Second, (software) you could have a corrupt or mismatched driver assigned to the machine. We recommend reloading or replacing the existing driver with a PCL5 or postscript driver. At this point, if the problem persists, you most likely have a hardware failure and may want to call a qualified technician to help you resolve the issue. However, there is one more thing you should try if you are printing through a peripheral device. Third, (hardware) if you are printing through a switch or using a NIC (JetDirect) card installed in the formatter, try eliminating these devices, one at a time, and see if they may be the culprit. At this point, you have exhausted all troubleshooting steps possible without technical assistance. Please call our office and one of our qualified technicians will be happy to help you determine if it is time to generate a service call.